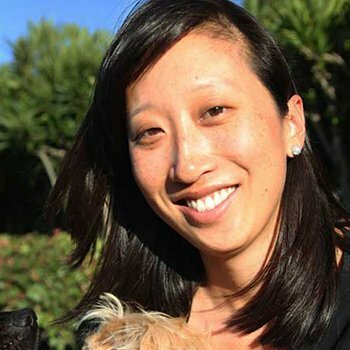 Dr. Erica Chiu’s warmth, energy and passion for animal care are apparent right away. A Bay Area native, she moved to San Diego for undergraduate studies in neuroscience and physiology. She then went to UC Davis for her DVM, followed by a postdoctoral internship at the East Bay Veterinary Specialists in Walnut Creek with training in surgery, ultrasound, and emergency care. Dr. Chiu is excited to be joining San Bruno Pet and returning to the Bay Area. Her pets are “Pennie”, a three-legged Cocker Spaniel and “Charley-Girl”, a Black Lab Mix, both rescue animals hit by cars. Outside the clinic she loves to hike, bake, go to concerts, and is learning to rock climb.